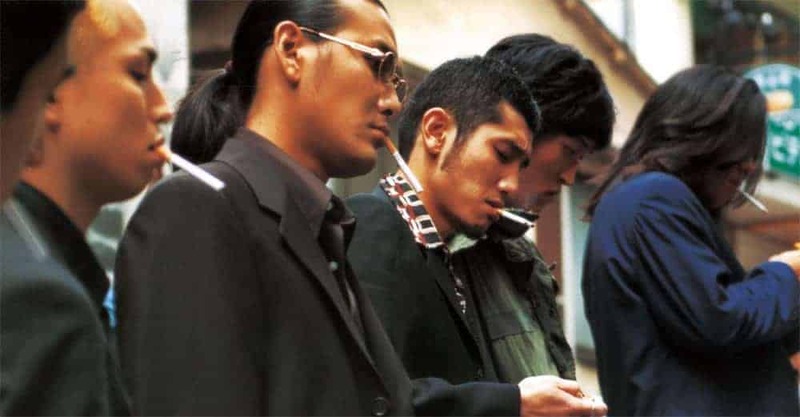 Using crime-filled Shibuya of the 90’s as his setting, Toshiaki Toyoda presents a true guerilla film, which frequently functions as a music video. The film starts with a mysterious, almost catatonic young man named Arano, walking in the street and bumping everyone around him, in a more violent edition of The Verve’s “Bittersweet Symphony” music video. Eventually, he stumbles upon Kamijo, a young club-owner who struggles to stay away from the Yakuza, despite the fact that he is kind of a gangster himself. Through a series of violent episodes, Arano ends up in Kamijo’s group, as the latter appreciates his knack for violence. Their relationship though, is anything but smooth. Toshiaki Toyoda presents a world where violence is the rule, where every man seems to be a gangster or on his way of becoming one. This world seems to be a perfect fit for Arano, who emits ferocity and blood from every pore of his body. Despite the fact, he does not seem to enjoy the setting or his circumstances, since his only purpose is violence, particularly against Yakuza, for no apparent reason at all. In that fashion, the film contains a number of extremely brutal scenes, where knives seem to be the weapon of choice, with the one where Arano comes across Kamijo’s archenemy being the most impressive and the most savage of all. As usual in Toyoda’s films, some surrealism is also involved, while the characters’ motives are not always clear, particularly in the case of Arano. Women, clearly, hold a secondary role, and Toyoda seems to mock the sultriness that usually characterizes them in similar films, particularly with the character of 5-star Pussycat. Music plays a very important part in the film, with a number of alternative rock tracks by Dip providing a fitting background for the ragtag surroundings of Shibuya and the many action scenes. Along with some slow-motion sequences that occasionally appear in the movie, “Pornostar” frequently functions as an extreme music video. The production is obviously low budget, but Norimichi Kasamatsu does a great work of portraying the decaying and moody atmosphere of Shibuya on the streets and the motley colors of the interior settings, like clubs, and toilets in bars. Toshihide Hukano’s editing keeps the film flowing and exemplifies the violence of the action scenes by rapidly changing perspectives of the same scene. Overall, the production values seem to benefit the most by Third Window’s HD edition, which makes the film seem and sound better than ever. Chihara Junia gives a great performance filled with aggressive silences, as Arano, impressively portraying a character whose sole purpose seems to be violence. Onimaru also looks good as the smooth but struggling low-rank gangster Kamijo. Akaji Maro provides a cult element as the Yakuza Boss. Kiyohiko Shibukawa holds a small role as one of Kamijo’s underlings, but still manages to stand out, with his goofy smoothness. “Pornostar” is not a masterpiece, but it is a very entertaining film that flows smoothly, and a great place for someone to start his association with Toyoda’s filmography. Third Window Films presents this film along with Unchain and 9 Souls in a limited edition digipack of 2000 copies that features new HD masters with optional English subtitles. The collection is titled Toshiaki Toyoda: The Early Years, and the extras include new audio commentaries by Midnight Eye’s Jasper Sharp & Tom Mes, a new interview with Toshiaki Toyoda, Making Ofs, music videos and other extras from the films’ original releases.